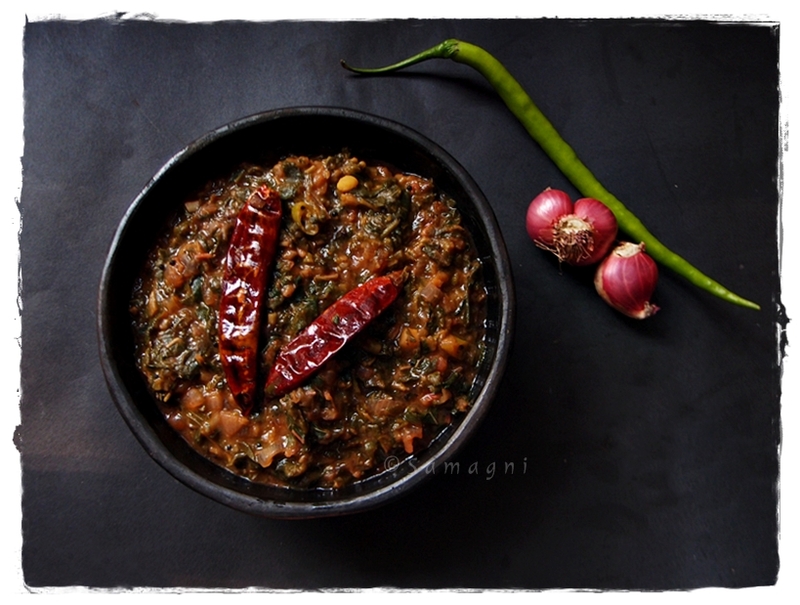 A simple and nutritious spinach dal curry that tastes great with both roti and rice. You can prepare this with toor dal, mung dal, masoor dal or a mix of all of these. I cook this at least once a week to ensure regular consumption of greens. Wash the spinach, drain the water completely, and chop them finely. Peel garlic and onions. Wash the tomatoes and green chilies. Chop each separately and keep aside. Heat oil in a pan and add the cumin seeds and hing. When they start to splutter, add finely chopped garlic and green chilies. When garlic and green chilies start to change color, add finely chopped onions. As onions turn translucent, add chopped tomato. Add turmeric powder and chili powder. Cook until tomatoes turn mushy. Add the chopped palak. Cover and cook for 2-3 mins until palak wilts and turns dark green. Add cooked dal. Add salt and mix well. Add water if needed to bring it to the consistency that you desire. Bring to boil. Remove from fire. Add a tbsp of lemon juice and mix well just before serving. Serve with roti or rice along with a dry vegetable side dish (preferably lightly roasted). Tastes awesome. grind it in a mixer. Add it to the well-churned dal, you can also have this on its own like a soup. You may add chopped ginger also along with garlic, if preferred. on stove-top, add about 3 to 4 times the amount of water.